Digital UltraViolet and Digital Copy will makes it possible for you to stream the movie ANNIHILATION HD UV Code instantly to your computer and compatible Smartphones, Andriod, iphone, iPod Touch, iPad and tablets devices anytime, anywhere. 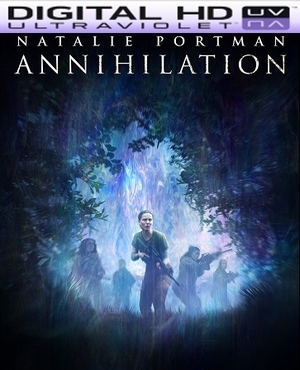 You can also download a Digital UltraViolet Copy or a Digital Copy of the movie ANNIHILATION HD UV Code to your computer and compatible devices. 5.0 out of 5 stars An instant sci-fi classic - yes, really. I have seen this movie twice now in the theater and I'm still processing it. There are plenty of reviews online that pick apart its meaning, but the bottom line is that this movie belongs in your Blu Ray library between confirmed classics like 2001, Brazil, and Alien, and modern-day classics like Interstellar, Inception, and Monsters (or Arrival, if you haven't seen Monsters). If you haven't yet seen Annihilation, do yourself a huge favor and view it on the biggest television and the best sound system you can find. If that means buttering up your friend with lots of disposable cash who has a Dolby Atmos home theater, do it. Bring the Blu Ray over, and tell him (or her) to crank it up. This film has the most amazing sound design you've heard in ages. As for the story and execution itself, it walks a perfect line between horror and psychedelic splendor. You'll be disturbed by what you're watching, but you'll feel that childlike wonder at the newness of it all. You'll recall feelings of watching those sci-fi classics many many years ago, but it's all kind of jumbled up in a mashup prism and is put back together in a way you haven't yet seen or heard. This is a film to be experienced, and one I can't wait to experience again, hopefully with some excellent commentary tracks and bonuses.